Xiaonan City God Temple houses the diety that guards the city. The main hall is decorated with dragons surrounding the idols for Zhu Yigui. Insurgencies abound throughout Taiwan’s history, but probably the largest and most successful one happened in the 1720s. In fact, it was this insurgency that led to the building of the first city walls around Tainan. The leader of this rebellion was a duck keeper named Zhu Yigui (朱一貴). Zhu was a natural leader who kept all his ducks in a row, but his discontentment caused him to give up duck keeping, fall in with outlaws, and become a Robin Hood type bandit. His anti-government movement took up the cause of a Ming Dynasty restoration and soon became a full-fledged revolution. Zhu’s band of insurgents were able to capture the capital (Tainan) and force the Qing soldiers back to the mainland. Zhu Yigui was crowned emperor of a new era (called Yonghe 永和 or Eternal Peace) and began ruling the island. The Qing army of course regrouped, returned, and regained control of Taiwanfu (Tainan) after a pinch of battle and a cup of soothing was given to the insurgent population. Zhu Yigui was then taken back to Beijing and executed, but has remained a folk hero in the hearts of many Taiwanese. His deified spirit now serves as protector of Tainan at the Xiaonan City God Temple. One of the three main city god temples in Tainan, this one focuses more on protection while the other two (particularly the one on Qingnian Road) are about judgement. This temple is heavily decorated with images of soldiers as well as dragons. 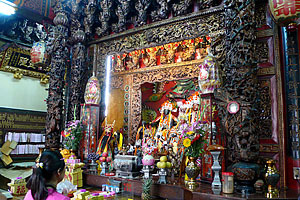 The two door gods are flanked by dragon-phoenix paintings on the outer doors and some very ornate dragon sculptures are mixed in with the elaborate wood carvings that surround the idols of Zhu Yigui. It is not a large temple. It has just two small halls. The main hall is dedicated to Zhu Yigui and rear hall is dedicated to Matzu. The temple dates from the 1860s. Puppet shows are a common sight opposite this temple. 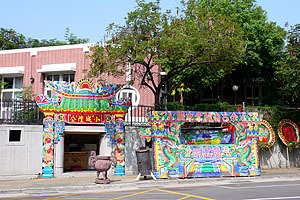 Despite its relatively small size, the temple is very active with a large group of dedicated worshipers who are famous for funding puppet shows. The use of puppetry is common way to honor deities, but no place in the city does it seem more common than in front of Xiaonan City God Temple. The temple funds many puppet shows a year that are set up opposite the temple and adjacent to the curious shrine built into the wall there. If you pass along Kaishan Road often enough, I’m sure you’ll be able to partake in Zhu Yigui’s most frequent form of entertainment. Otherwise, plan to visit the temple for the deity’s birthday on the 13th day of the 5th lunar month. Could you post big close up of Xiaonan City God picture on this website because I like this temple very much. Thank you. Please post big Xiaonan city god temple picture. I like this temple very much. This is my 3rd request.Since you hope people to have comments. Please have some answer,have some reply.Do not just leave me waiting.Thank you for your reply.Thanks again. I’ve already replied to your personal email that is attached to your comment profile. I explained to you that you are asking me to give away free content. If you wish to hire my services to photograph the temple then you can begin correspondence by sending me an email at tainancityguide@gmail.com. Low resolution images from this website can be downloaded for reasonable use. High resolution images will require payment for use.